This is the fourth post in a five part tutorial for making a paper tape dress form that truly matches your measurements and body shape. But as is, it is larger than your actual body measurements. I tried on some of my clothes on my outer paper tape dress form, and clothes that fit me fine were super tight on the dress form. The area where my neck meets my shoulders was also bulky and did not match my actual shape well. Here’s a look at the inside of the form. I was short on rib knit fabric for the T-shirt, so that’s why you see two colors of fabric. Here’s how to make a dress form that does match your measurements. 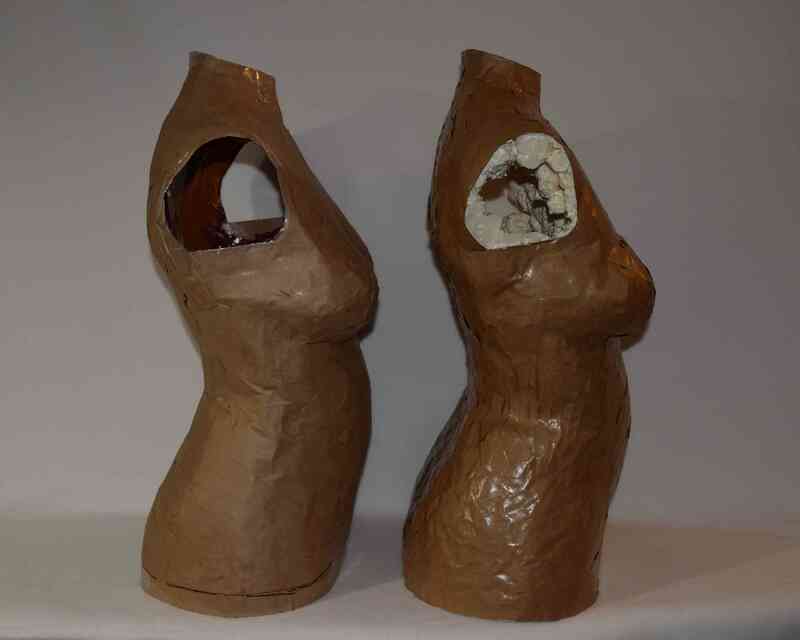 Completely cover the inside of the outer paper dress form with plastic packaging tape. You might want to use the thinner, cheaper kind rather than thick mailing tape. Wrap plastic tape over the edges of the dress form. I started out using clear tape, then switched to orange. It was much easier to keep from missing spots with the colored tape. I also found wearing a head lamp helped me see inside the dress form. Now you want to rub a very thin layer of oil on the inside of the dress form. Put a little oil on a rag or paper towel and rub it all around inside on the plastic tape. I used coconut oil, which I think was too slippery and went on too thick. I’d suggest trying a liquid cooking oil instead. Mineral oil might be OK, but I wouldn’t use petroleum jelly – like coconut oil, I think it would leave too much residue and be too slippery. With a clean rag or paper towel, rub all around inside the dress form to wipe off as much oil as you can. You want a really tiny amount of oil on the plastic tape. If you use no oil, it will be hard to get the outer form off and you might damage your dress form, but if you use too much oil, the paper tape will not stick on the inside of the dress form. 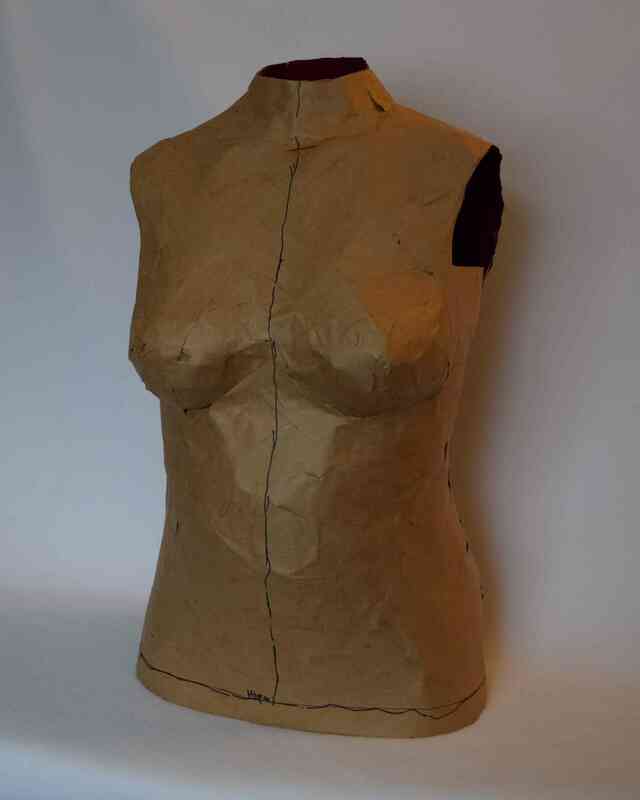 Now cover the inside of the dress form with a layer of paper tape. The paper tape shrinks a little, so you might want to leave a gap at the waist, let the tape dry, and then fill in the waist area. This might help it not end up too short. Also, don’t get your tape very wet – wetter tape shrinks more. My final inner dress form is 1 cm (3/8″) shorter than the outer form from the top of the neck to the base. I think the reason my paper tape shrank so much was that I was having trouble getting the tape to stick to the plastic tape, so I got it wetter than usual, which causes it to shrink more as it dries. If you are having trouble getting your tape to stick, try rubbing off some more oil from the plastic tape, maybe with a cloth slightly dampened in soapy water. Don’t get your tape too wet like I did. I don’t think that having my dress form a little too short is going to cause problems, though. Realistically, 1 cm is within the margin of error when taking measurements on the body. The only time I can see it might be a issue is when I drape a sloper on my dress form, and in that case I can just add a little length to my patterns, which is an easy alteration. 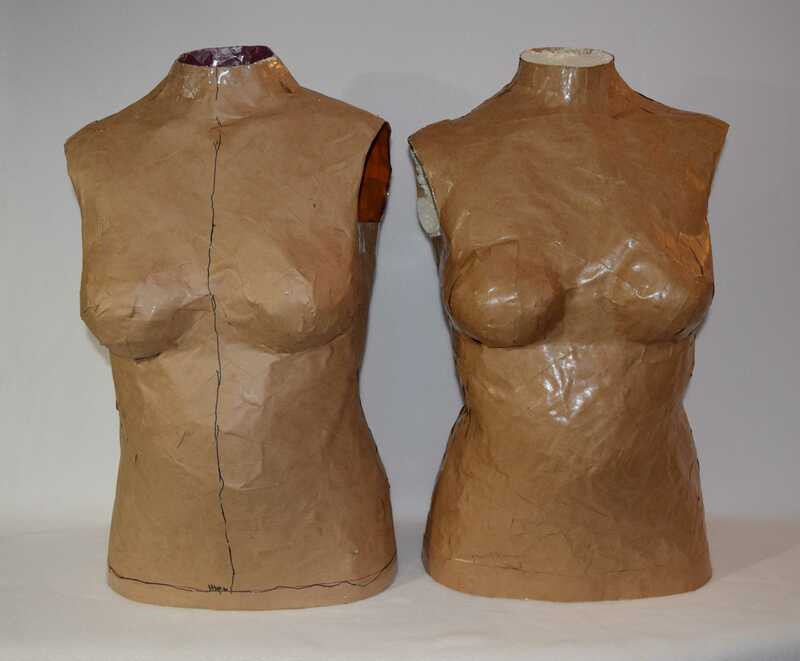 Leave taping the bust for last, so you have tape around it to anchor to. You can either add at least one more layer of paper tape to the inside, then strengthen the inside with expanding spray foam, or add several more layers of paper tape to the inside and skip the foam. In my previous experiment making a skirt form, I decided that it took six layers of paper tape for the form to feel strong enough on its own. 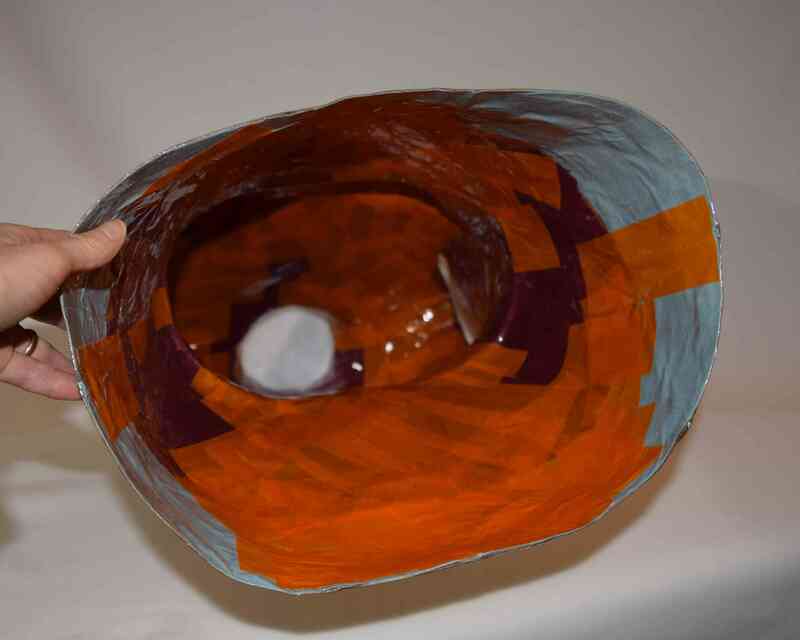 You can add a couple of layers of tape to the outside of your final form after you remove the outer form, which is easier than trying to tape inside the form (at least for me), so you would need at least four layers of tape on the inside plus two on the outside after you remove the outer form. 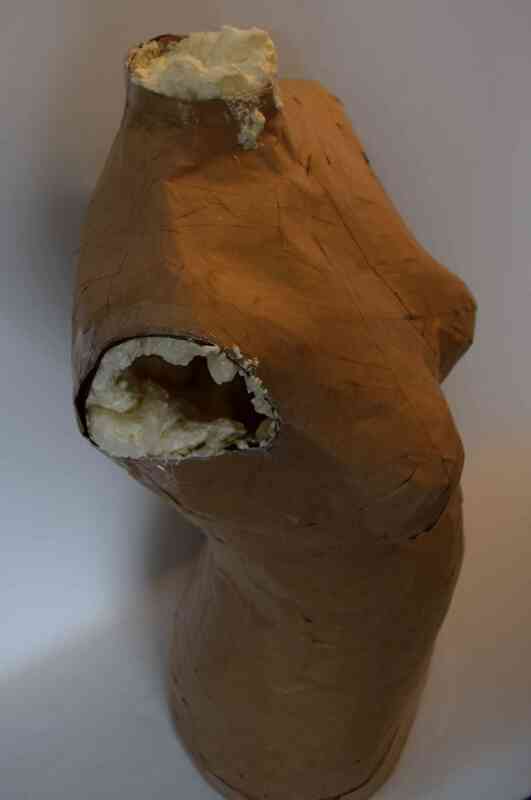 You can also stuff the dress form to help it hold its shape. This is a good use for that bag of fabric scraps you’ve been saving. I was tired of trying to reach inside my dress form to get paper tape in there, so I decided to add only two layers of paper tape to the inside, and then strengthen the form with expanding foam*. This stuff is really messy and every time I use it I end up ruining something with it. Usually it’s my clothes, but this time I got some on some nearby furniture. Once its gotten onto something, it will never come off, so protect a large area around where you are working, and wear old clothes and disposable gloves. The important thing is to add a layer of foam on the inside of the form, but don’t fill the form completely anywhere, or the foam will have nowhere to expand to and it will distort the shape of your dress form, or even burst it. I had to hold the dress form at an angle and drip foam down into the chest area, since the can has to be held upside down to dispense the foam, and I couldn’t reach in there. There are a few spots in the chest area where I couldn’t get any foam, but that doesn’t matter; it’s still plenty strong. I tried to apply the foam in rows. After you put some foam in an area, wait for a bit until the foam expands a little and sticks to the paper tape, then rotate the dress form and add some more rows of foam to another area. 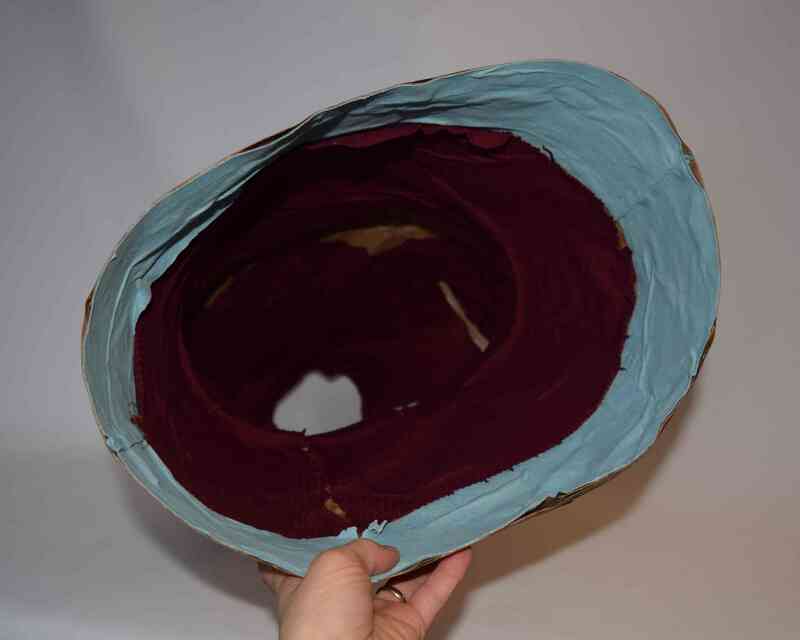 After the foam has cured (or your paper tape is completely dry if you just used tape inside), cut the outer form and remove it just like you did when you took the paper tape form off your body. You might need to carefully cut the outer form with a razor knife instead of scissors. 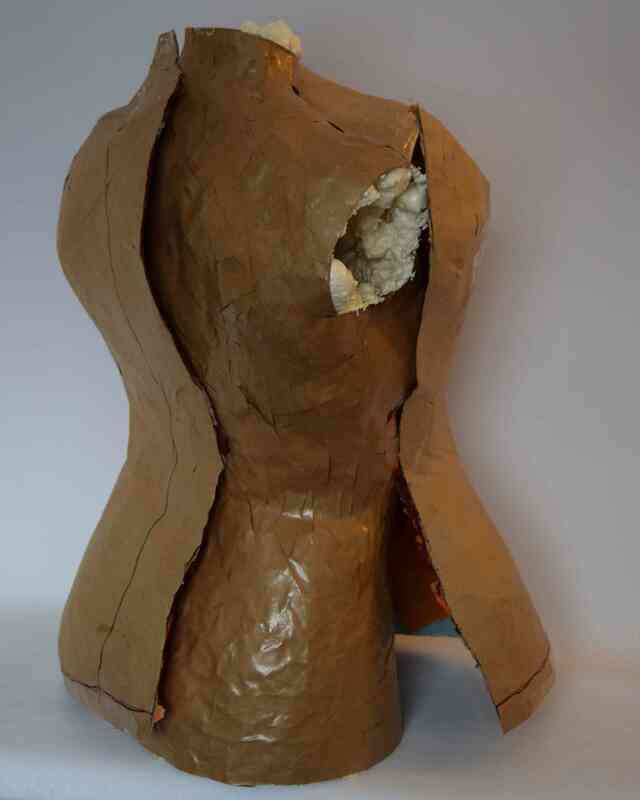 If your outer form is stuck to the inner form, cut the outer form in more places to make removal easier. 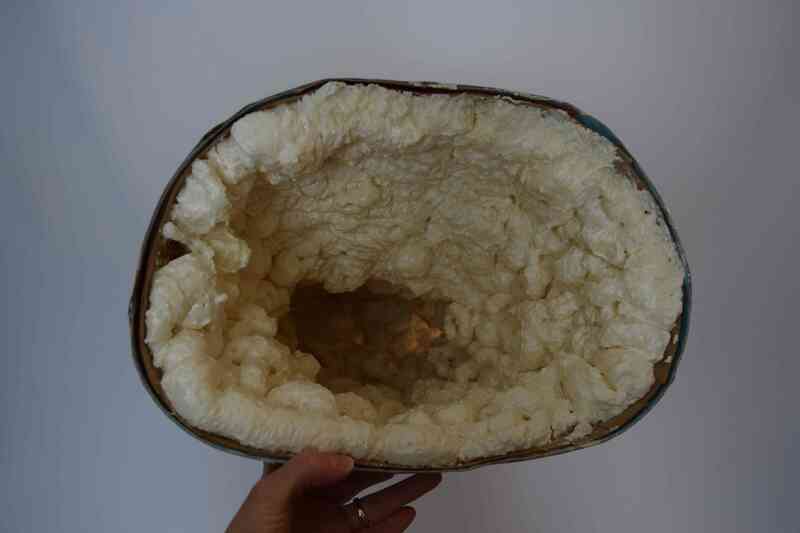 If you used foam, use a knife to trim it even with the openings. Now add one or two layers of paper tape to the outside of the final dress form. 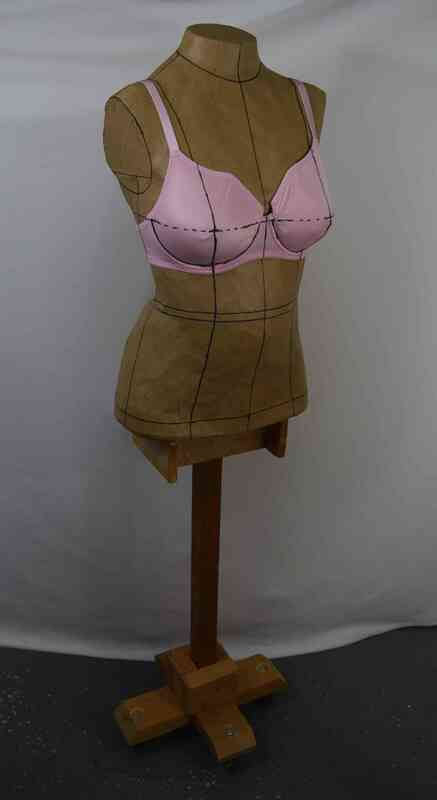 If you want to you can cut pieces of cardboard to fit the openings in the dress form, and glue and tape them in place. Glad Press’n Seal* works really well to make patterns for the cardboard pieces to fit the neck and armholes. Just stick it over the opening and trace around the edges onto the Press’n Seal, then stick the pattern right onto your cardboard and cut it out. 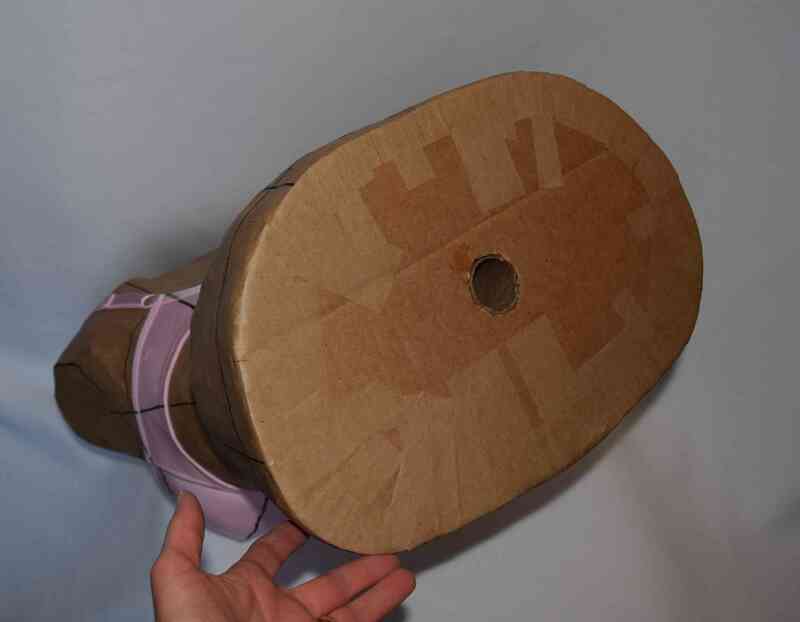 If you are sealing up the bottom, you can set the dress form on a piece of cardboard and trace around it. There are different options for putting the dress form on a stand. You can place your dress form over a vertical pole, such as an IV pole* or something you made from plumbing parts with a T at the top to support the shoulders, then stuff the inside of the dress form to keep it aligned properly. If you have a commercial dress form that is a lot smaller than you and you did not use foam inside your paper tape form, you might be able to slip your paper tape form over the top of the smaller form. Due to my sway back it would be difficult to put a pole all the way up through my dress form, so I put it on a platform instead. I glued together three layers of cardboard and cut them to fit the base of the dress form. I cut a hole in the middle of the cardboard base to fit a foot long cardboard tube (I think it was from a roll of plastic wrap) and glued the tube in place. Then I taped the base onto the bottom of the dress form with the tube inside. I have a dress form stand that I made from scraps of wood many years ago for my first duct tape form. I modified it a little to work with this dress form. I added a platform to the top, then drilled a hole and put in a dowel in the center of it. The dowel is quite a bit smaller than the hole in the bottom of the dress form. I did this because I knew the stand and dress form were both a bit wonky and I wanted to have enough play to shim the dress form to get it level. 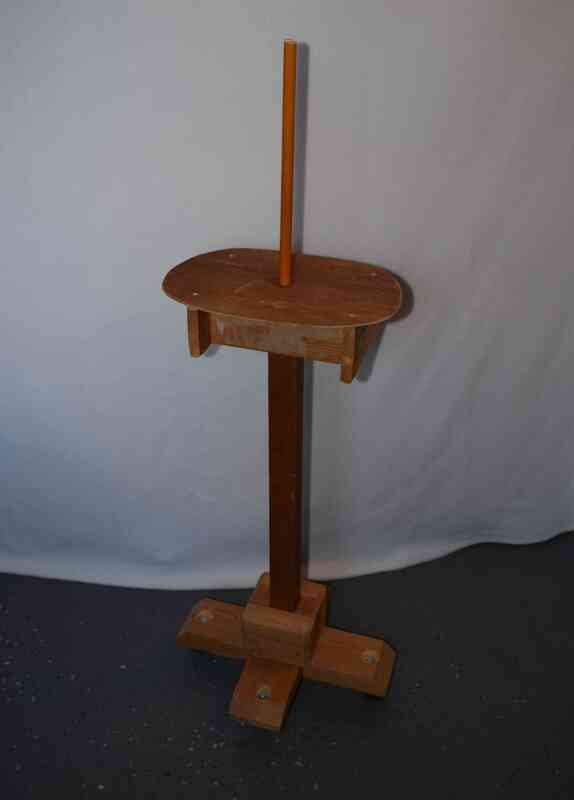 The main purpose of the dowel is to keep the dress form from falling off the stand. I wrapped some fabric around the base of the dowel to keep it snugly in place in the cardboard tube. I checked the measurements on my dress form and they were just a little smaller than me, which for the most part was good because I planned to add a cover on it, which increases the size a little. I did add some extra layers of paper tape to the waist to increase the size – I had had my paper waistband on a little too tight when I was being taped up. I tried one of my bras on the dress form to check the cup size, and found that the dress form’s bust was a bit too small, so I put a thin foam cup bra onto the form to pad it out a little. The foam cup bra also has the benefit of smoothing out some of the lumps and bumps on the bust. If you are happy with your dress form like it is, you can be done at this point. You probably want to measure up from the lower edge to locate the markings you made on the outer form for the waist, navel, and hips, and mark these on your final form. Paper tape forms are hard and slippery, so I wanted to make a woven fabric cover for mine to give me something to pin to. I plan to do some pattern making, so I also wanted to mark reference lines on my dress form similar to those on a commercial dress form. I’ll show you how I did that in my next post, Part 5: Marking the Form and Making a Cover.